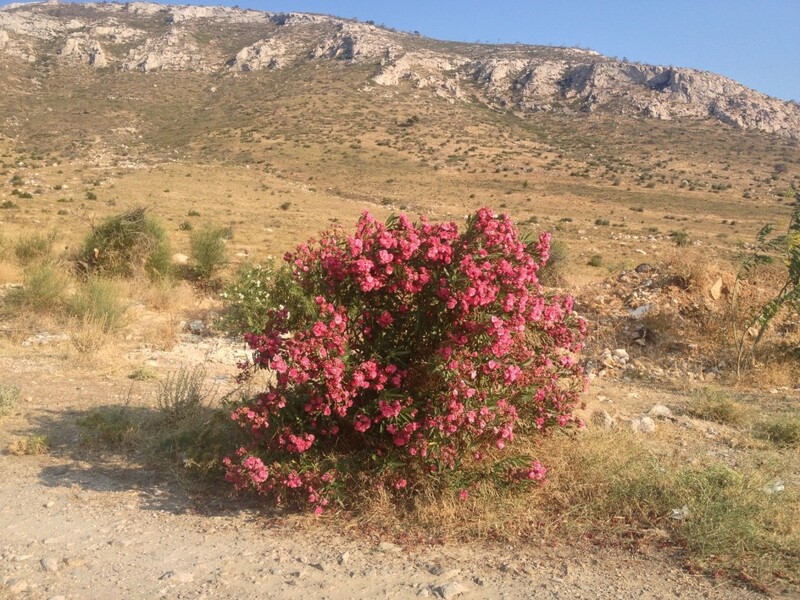 I enjoy my yoga not only for the physical benefits but the mental-health benefits as well ((Photo of pretty flowers in Greece is neither here nor there)). There's a quasi-spiritual, woo-woo element to it that varies drastically depending on the person doing the instruction. Because of that I've found I gravitate towards different instructors at my yoga place depending on my mood. Sometimes you want to positive reinforcements, guided relaxation practices and positive — even if obvious and trite — advice about life. And if that involves hearing stories about Shiva and goddesses and inner-spaces and chakras of possibly dubious scientific legitimacy, I'm okay with that! If the words have a way of soothing something sometimes that's real enough. Last week there was a particularly good one for me. The instructor told a simple, relatable story about continually running into the same person over the course of the day but never saying hello. It was a mild regret in the grand scheme of things, but something I think most people have experienced. It also struck me as the perfect example of one thing in a line of many simple things we could probably do to bring more joy into our days but, for whatever reason, do not. So as we bent ourselves into pretzel-like poses she talked posited the question — If today was your last day, how would you live? Obviously, she shared that she would've reached out a made a connection to this person. And so the topic bounced back-and-forth between living like you mean it and what we do (or don't do) to make connections in our day-to-day life. Like I said, it's sort of trite, self-help stuff — bordering on the saccharine even. But such things tend to hold kernels of truth and there's power in taking a little time out of the day to focus on them. And so I thought about those things. Between the slew of birthdays going on around me this time of year and other things going on I realized how short life really is ((Another not-so-profound revelation)). And I thought about connections, living life to the fullest, kindness and the things that come with saying yes. Maybe we don't live that way all the time because it's draining. No one said the right things or the best things in life come without effort. Sometimes they wash-up on the beach and other times they stop just short of the shoreline and we have to wade out into the waters, past the breakers and meet the opportunities. Maybe sometimes it's out of reach and you just have to let it drift by, but it's always so hard to know. That's why you have to try, to know that no matter how often you fail or things get away the real loss comes when you let these experiences harden your heart. When you stop trying to make connections, nurture the ones you've made or actively push them away. To not completely close your heart, to not site idle and cease to grow. I realized that putting my remarkably unlimber hamstrings on display in a sweaty room full of strangers is, somehow, exactly the community I need to keep me reminded about these things.